How should my DJs and musicians set up for my Heritage Prairie Farm wedding? I haven't met you, but I already know two things about your Heritage Prairie Farm wedding: It's going to be beautiful. And it's going to have a more complicated setup than most weddings do. I'm not clairvoyant; I just send a lot of DJs and musicians to weddings at Heritage Prairie Farm! We had 18 performances at the Elburn, Illinois wedding location just this year - and every event meant multiple sound setups and multiple outdoor locations for ceremony, cocktail hour, dinner and dancing times. At a Heritage Prairie Farm wedding, your guests are going to have grass under their shoes for at least part of the day - and they won't be spending too much of that day in any single location. What will that look like at your event? Below are pictures of the setups our teams use to make it work. 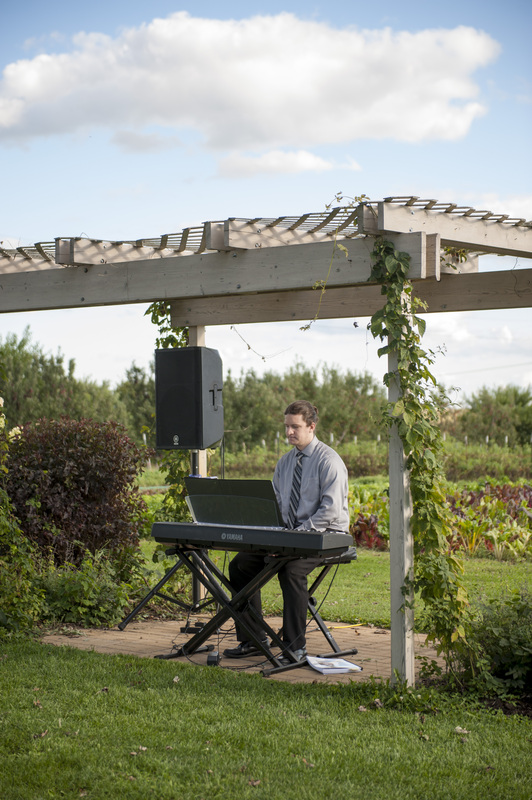 When it comes to outdoor wedding ceremony setups, music is the easy part. The bigger challenge is making sure that every guest can hear what's being said from up front, even in the back row. Notice what's NOT in the shot above? You don't see speakers, a mixing board or a sound engineer. We try to set up to the side or back of your guests, and space speakers wide so that they're out of the way of most of your wedding photographs. If you opt for live musicians, they'll set up out of the way as well - so guests can hear the music, but not necessarily be looking at your violinist throughout the wedding ceremony. We amplify musicians through the same sound system as your microphones. 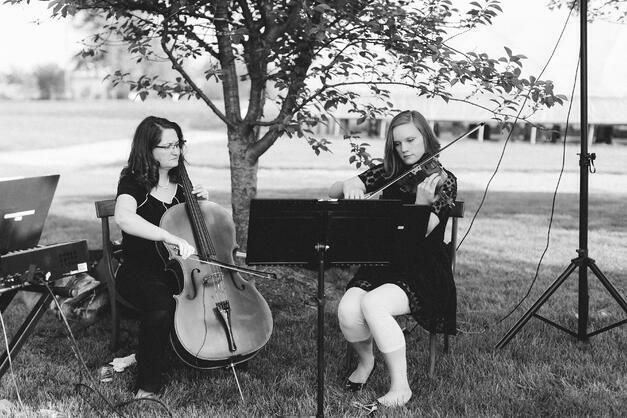 Above, a pop strings trio is set up to the side of guests, with violin, cello and electric piano all plugged in for everyone to hear. Put it all together and you get a situation like you see above. Notice our DJ (running sound) and trio (playing processional music) in the back of the shot, out of the way of most photographs. There's a speaker up front but spread wide, so it won't get in your photographer's way most of the time either. You and your wedding party are front and center. 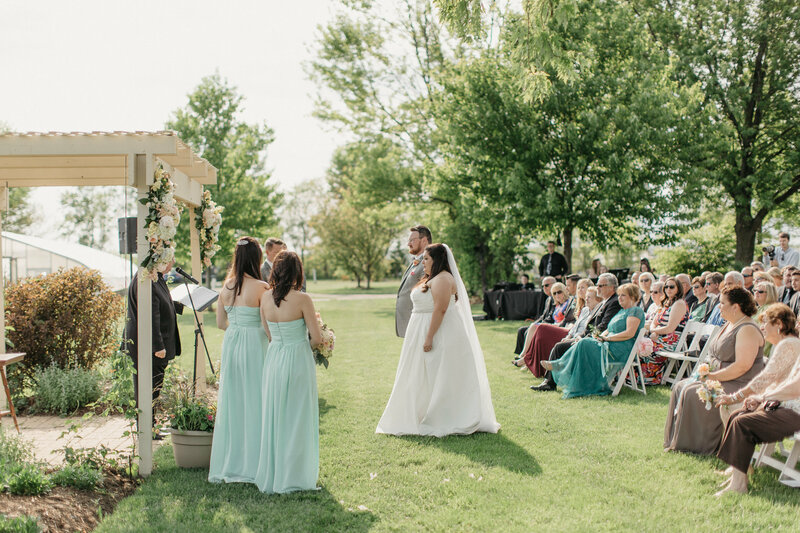 A Heritage Prairie Farm wedding gives you your choice of several different outdoor locations for your ceremony, but a setup like the one above works equally well for all of them. All locations have electricity, and Farm staff are wonderful collaborators with our DJs and musicians. Which means you shouldn't have to worry about any of this! Book your music and say your vows; we'll sweat the small stuff. Your wedding cocktail hour will either be outdoors or in the barn. In either case, a simple sound setup - often just a single speaker - usually fits the bill. You won't typically need microphones or other gear for cocktail hour, since most couples save the speeches until dinner time. While we usually use a more complex setup for dinner times, when guests will need to hear your toasts and other announcements, I like a sense of more "localized" sound during a wedding cocktail hour. Music should seem louder to guests who are close to it, and quieter - but still audible - to those who opt to stand further away. You can get a sense of that experience in the video below. 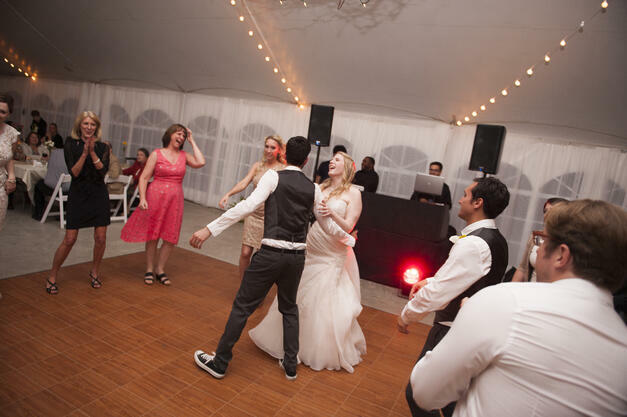 If you opt for DJ music during cocktail time instead of a live ensemble, expect an even simpler setup - your DJ's primary sound system will be in the tent for dinner and dancing, while a secondary system will be in your cocktail space. This makes for the smoothest transition when your guests move from one space to the next - they'll hear music in both spots. One thing you WON'T need for your Heritage Prairie Farm wedding reception is uplighting. Couples often opt for decorative lights to add a splash of color to the walls in more traditional reception spaces - but as you can see from the picture below, the "walls" in the Farm's reception space don't need much augmentation! 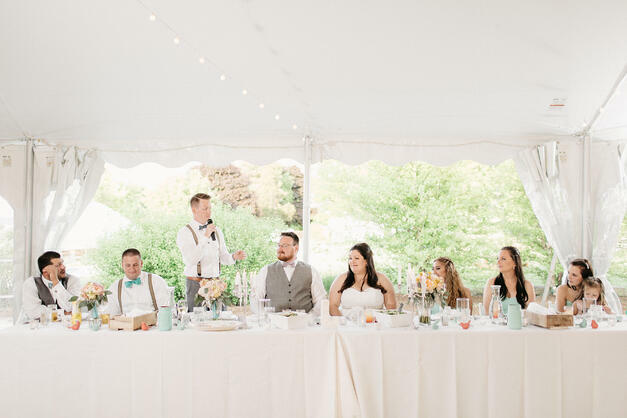 The Backhird DJ setup is as simple and as clean as possible - you can see what it looks like in the reception tent at Heritage Prairie Farm below. 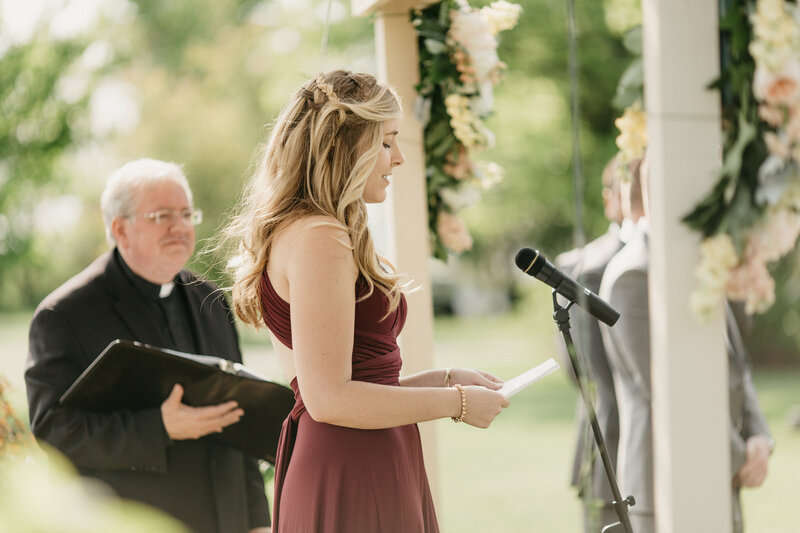 Before dinner starts, your DJ will gather your wedding party outside the reception tent and double-check names in order to introduce you - assuming that's something you want to do, of course. You'll be entering from outside the tent to where your guests are already seated. While there are plenty of things to do at Heritage Prairie Farm, the last several hours of your night are usually spent dancing. 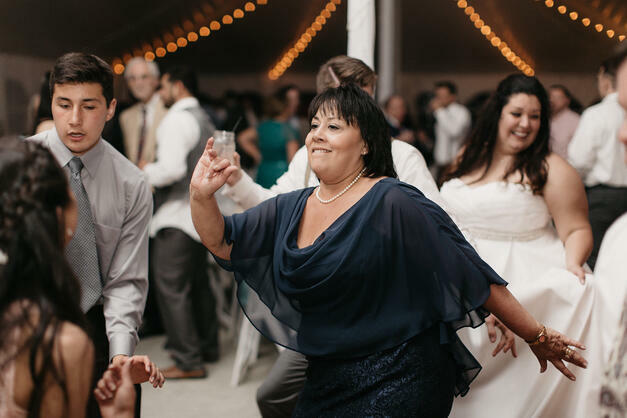 The reception tent makes a great place to dance the night away - with the open sky never more than a few steps away for guests who want to cool off and grab a drink. 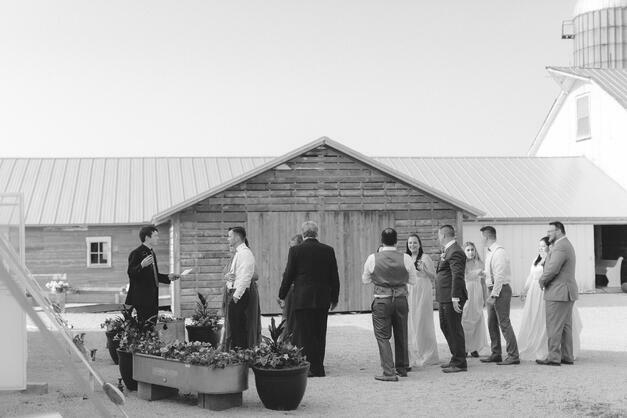 If you need a photographer who knows Heritage Prairie Farm weddings, Maggie Fortson Photography and Kelly Vanderploeg Photography provided the beautiful photos in this post. 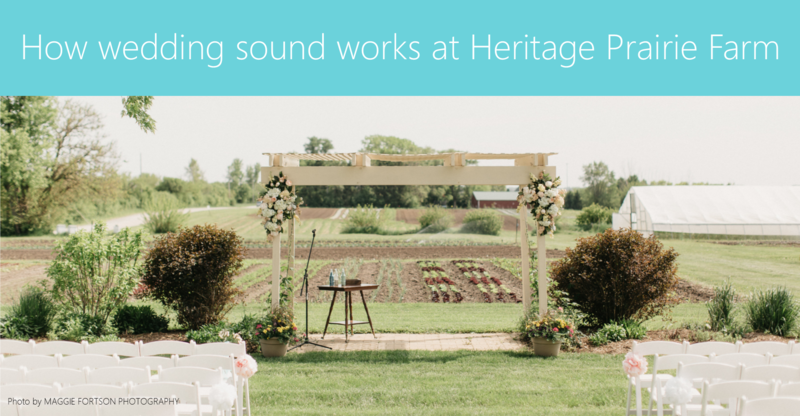 If you need a DJ or musicians, check out the ebook below to see some actual packages and prices Backthird has put together for past Heritage Prairie Farm wedding clients - or contact us directly to build your own personalized plan.